Actually I am not sure whether I wanted to share with you guys my bilik pengantin. haha...Cz it doesn't looks like bilik pengantin that u guys usually see. Since I will only be staying in the room like for two days, I just keep it minimal and the most important is practical. For me, what's the point of hiring a decorator if the looks only stays for a day. So, I just make sure the bilik was kemas n nice looking. However, I was very sure that time that people coming wud wanna see the room no matter what reason u gave. So, I prepared something that's kind of exclusive showing that the room will be occupied by pengantin later. The something was just a small space with pictures of us. Ni la sudut tu..haha..just pictures of us hanging there je. I think the pictures really works la since we took pretty2 pictures=p ahaha.. So, for those who's an IKEA's regular sure are familiar with all the things shown kan? ?haha...I took all cheap things. 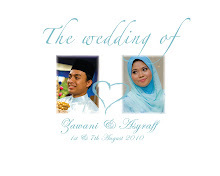 So, total cost for this deco mmg x sampai rm100=p hehe..
Alhamdulillah....even so, it turned out fine in pictures. This is from the unofficial. Hope the OP will do better. The bed. Sorry for low quality picture..see...i didn't even re-paint my room. There's crack lg on the wall..haha..For the empty wall, I just put a pink orchid je as finishing. The bedsheet, from JUSCO during JCARD day. Mcm biase..no more than rm100 ye.. The langsir I bought at Pasar Pagi 2 days before my wedding. See la the materials..I bought a very cheap one, not even reach rm50=p ahahhaa..
Another empty wall was filled with small racks.Oh, sape letak kuceng burok kt situ! Oh, there's my shoes hanging=p and u can see my dress from the mirror=p ehehe..
Wani, balik buatkan room aku. Hahaha XD Cun la bilik ko. simple but nice! AKu suke shelf tu and pictures and mirrors tu. well done! love it! wani...small shelves tu ko beli kat ikea jugak ke?